A plethora of propulsion options greeted me at this year’s Miami boat shows. From joystick helm controls to hybrid diesel-electric inboards to electric and propane-powered outboards, the Progressive Insurance Miami International Boat Show and the Yacht & Brokerage Show in Miami Beach were a showcase of the latest technologies. At the Sea Isle Marina, the NMMA show’s in-water segment, there was no shortage of joystick steering systems. Teleflex (now SeaStar Solutions), Volvo Penta, Mercury, Yamaha and others made the scene at this Biscayne Bay boat basin. I was able to test two new joystick systems for outboards: Yamaha’s Helm Master and Teleflex’s Optimus 360 by SeaStar. I had already tested Mercury’s Joystick Piloting for outboards at the Fort Lauderdale International Boat Show last fall. Yamaha’s Helm Master functions with its V-6 4-strokes — the F225, F250 and F300 — as well as the V-8 F350. The Optimus 360 system was married to high-horsepower Evinrude E-TEC outboards. Advanced steering systems and new features such as steering friction control complement these joystick systems. “It’s not just about the joystick,” says Yamaha product design manager David Meeler. I tested Helm Master on the new Pursuit SC 365i Sport Coupe with twin Yamaha F350s and Optimus 360 on an Andros Offshore 32 center console with a pair of 250-hp E-TECs. I also tested Yamaha’s new 4-cylinder 200-hp 4-stroke on a Sportsman 229 center console. The 487-pound F200 has some get-up-and-go, for sure, thanks to its variable camshaft timing. The boat accelerated from 20 to 30 mph in about 4 seconds and saw 43 mph (WOT) in another 3-1/2 seconds. The engine held its grip as I threw the boat into some high-speed doughnuts. The F200 weighs 119 pounds less than Yamaha’s V-6 F200 and 14 pounds more than its 2-stroke Z200 HPDI outboard. It’s built around a 2.8-liter, 16-valve dual overhead camshaft powerhead. The representative from Sportsman, Ralph Archer, liked the way the boat stayed on plane at just 15 mph. “That slow planing speed is ideal for driving in rough waters when 15 mph is as fast as you would want to go,” he says. I started the day aboard the Pursuit 365i, an innovative boat that hides its outboards in a stern compartment that separates the cockpit and the swim platform. 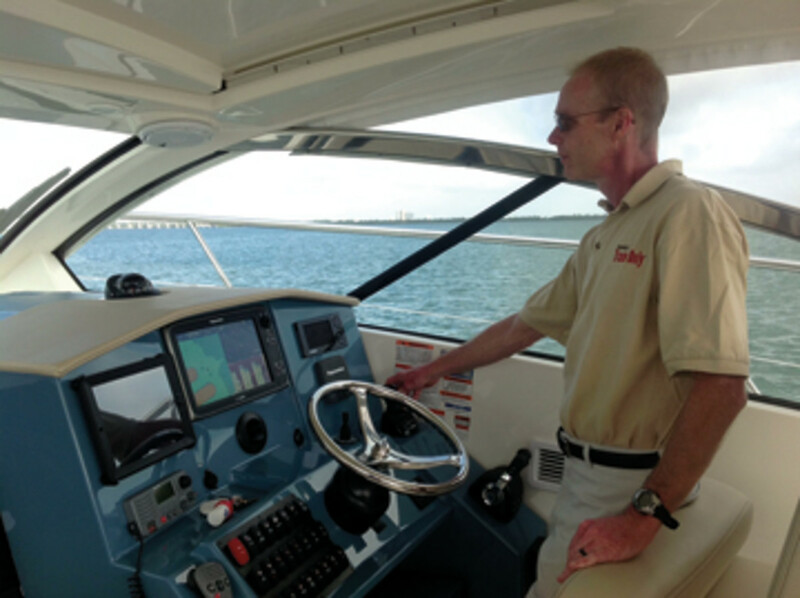 I was already familiar with the boat, having tested it at the builder’s press outing in Fort Pierce, Fla., but this was my first experience with Helm Master. Standing at the helm, Meeler showed me the functions and features. With its friction control, you can set the number of wheel turns it takes to get from lock to lock, as well as the required steering effort, or “friction.” Helm Master friction control gives you a range of 4 to 9 turns, lock to lock. The boatbuilder takes care of the default setting, which in this case was seven turns. To begin, shift into neutral and press the “joystick” button. Meeler advised me to move the stick in a rolling motion, and I maneuvered around a navigational marker — a piling — a few times. The Helm Master’s thrust overcame the swift current. Twin F350s powered the Pursuit. Meeler says that with triple-engine setups the center engine remains active in reverse. “With other systems it’s idle, but we’re using it for extra thrust,” Meeler says. The Optimus 360’s lock-to-lock steering can be set from 3-3/4 to 8 turns. The system has two thrust settings: “normal” and “boost.” The skipper pushes two buttons to engage the joystick — the “+” button on the throttle control unit and a boost button on the joystick base. I ran the Andros in the same track as the Pursuit test, circling a piling and pushing the bow here and there. The Optimus 360 seemed to deliver a little more thrust than the Helm Master, which may be attributable to the Pursuit outweighing the Andros. Overall, the joysticks and steering systems did what they are designed to do: give the driver precise control of the boat. With both, transitioning from the conventional sticks to the joystick was seamless. I tested Torqeedo’s 80-hp Deep Blue electric outboard on an 18-foot Zodiac. Chris Carroll, Torqeedo vice president of business development, was on board. Acceleration at the low end of the rpm range was immediate but waned in the midrange, lacking the pop of a gasoline-burning outboard. We topped out at 20 knots and settled on 14 knots for a comfortable cruise. The Deep Blue outboard is $20,000. The price includes a battery charger, throttle, construction box, on-board computer with GPS and display, and prop and hub. Battery banks of two, three and four are $32,998, $49,497 and $65,996, respectively. You need a minimum of two batteries. The batteries are backed by a 9-year capacity warranty. Mercury Racing unveiled a new 1,650-hp engine that’s state of the art all the way. The 9.0-liter quad-cam 4-valve (QC4v) cylinder block and head design work with Mercury’s SmartCraft Digital Throttle & Shift to deliver “big power with luxury-car-like drivability,” according to the engine manufacturer. The Mercedes Cigarette AMG Electric Drive Concept uses 12 electric motors. The 38-footer can reach 99 mph and it packs 2,221 horses. A new engine from Lehr is also green, but it’s only 9.9 hp and powered with propane. 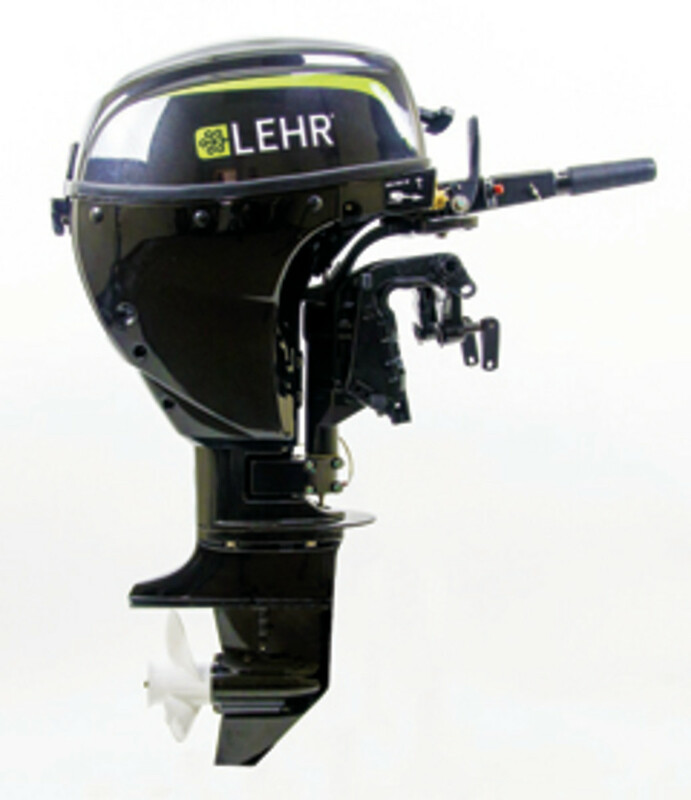 Early last year, Lehr introduced its first propane outboards: 2.5- and 5-hp engines. BRP’s new 135-hp, high-output 2-stroke — the Evinrude E-TEC 135 H.O. — will be a good fit in single applications for small center consoles (under 22 feet or so), flats boats and bowriders, among others, the company says. Twins will match up well with larger center or side console boats, as well as power cats and pontoons. Cummins’ new QSB6.7 — a 6.7-liter diesel — packs more power and runs cleaner and quieter than the 5.9-liter engine it replaces. It can be used for conventional inboard and Cummins Zeus pod installations. This article originally appeared in the April 2013 isssue.